2018 was the inaugural year for my limited edition calendar featuring photographs I have taken while in a state of mindful awareness, a state of being and creating that I eventually came to refer to as my contemplative photography practice. More about that practice in paragraph 3 below. Making the Calendar this year and last year: As a creative act in and of itself, selecting the images, assigning each to a specific month in the year and the design of the accompanying calendar page was so satisfying for me that I felt compelled to repeat the process for a 2019 calendar. In 2018 I accompanied the images with poetic prose and poetry that felt somehow resonant with spiritual elements in the photographs. In 2019 the images are presented wordlessly in my attempt to discover if they indeed are ‘worth a thousand words.’ Your feedback is welcome. 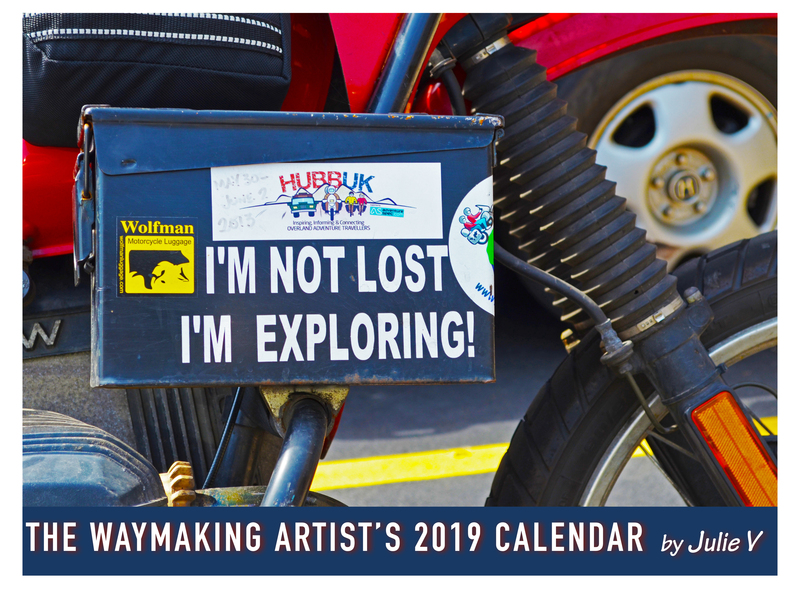 AND, I have a few more calendars left in the original run of 100 – they begin with February 2019 and end with January 2020. Email me if you’re interested in purchasing one: julia.m.volkmann@gmail.com — $10 per calendar plus $2.50 to ship. Tell me your birthdate and I’ll personalize it for you. About my practice: Even before I found a way to label this practice (or should I say “characterize” this practice? ), I had been explaining to the unfortunate souls who had to suffer my long philosophical ramblings on the subject that the act of taking the pictures afforded me an opportunity to be still and be totally immersed in the contemplation of the object or scene in situ; the quality of the light, the touch of air on my skin, the sounds of the place and the sense of being both observer and subject in the image, even if I was not seen in the viewfinder. My experience of capturing the image was actually an act of paying deep attention, which elicited in me a stillness, a focus, an awareness of the breath that everyday noise and bustle of life could never permit. During my MFA IA studies at Goddard College in Vermont, my photographic practice was awakened again after lying dormant for some years. When I submitted a series of my photographs as part of my portfolio work for that semester, it became necessary to research this “thing” I was doing so that I could speak of this art practice in relationship to others’ work in the world – how it might be similar, where it differed, etc. I was gratified to find Stephen Batchelor’s essay “Seeing the Light – Photography as Buddhist Practice” in Buddha Mind in Contemporary Art, edited by Mary Jane Jacob and Jacquelynn Baas (University of California Press, 2004). I saw how Batchelor and I were aligned in our approach and experience, even though the work we produced was not at all similar. Having read his essay, I was able to lay claim to the term “contemplative photography” as the way to refer to my practice. About the cover image: I took this picture on my way back home from Goddard College summer session in August 2014. I had stopped at a local motel for the night. The next morning this motorcycle was in the space next to mine. I was stopped dead in my tracks by the message and had to dig out my camera to take the picture before I went across the way to get my free coffee and continental breakfast (i.e. dry sweet roll) prior to continuing my drive home. When I feel most aimless or hopeless or clueless about whatever road I have found myself on – be it spiritual, metaphysical or literal I try to remind myself of the value of exploring. The straightest distance between two points is not A way, or the ONLY way, or the best way, to get where you’re going. Life happens on the journey.